When we first decided to set up a stand-alone freezer and freeze our own "convenience foods," I never planned to jump fully into Once-a-Month Cooking (OAMC). I still don't, but this weekend I had a perfect opportunity to stock the freezer, so I spent a few hours cooking specifically to fill the freezer. We'd shopped at a warehouse store and brought home 12 pounds of ground beef. We've already found that meatballs are one of our favorite ways to use the freezer: it's extremely efficient, and it's the only way we have spaghetti and meatballs on busy weekdays. 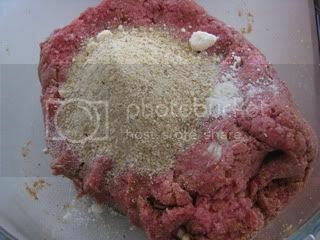 I decided to use 6 pounds of beef for meatballs, 3 for meatloaf, and 3 for browned meat (which can be used in chili, sloppy joes, burritos, etc.). I didn't start with a written plan, but I should have: I was lucky that the mistake I made wasn't a problem! The mixture seemed too wet, so I added more breadcrumbs and some grated parmesan cheese. I shaped the mixture into meatballs and put them into two 13 x 9-inch pans for baking (425 degrees for about 20-25 minutes). 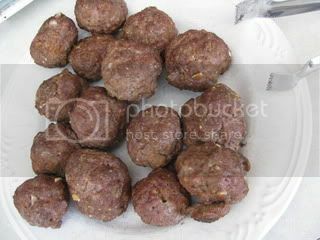 I still had about half of the meat mixture left, so I shaped it into meatballs, layered them in one of the bowls, and stuck it in the refrigerator. 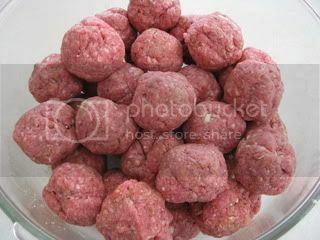 While the first two pans of meatballs were in the oven, I opened the second 6-pound package of ground beef. I started browning half of it in a large skillet, and put the other half in the other mixing bowl. (Yes, I reused the bowl I'd used for the meatball mixture.) 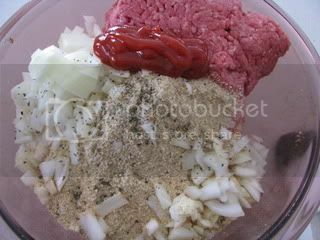 I added the rest of the meatloaf ingredients--chopped garlic (reserved from what I'd chopped for the meatballs), chopped onion, breadcrumbs, black pepper, basil, and ketchup. I'd intended to shape that into two 1-1/2-pound meatloaves, but those didn't quite fit into the quart freezer bags that I'd already labeled. 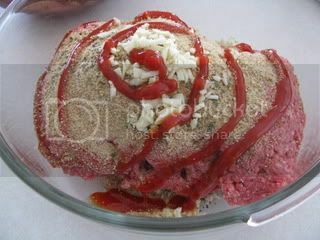 I decided to make three 1-pound meatloaves instead. I wrapped them and put them in the refrigerator. 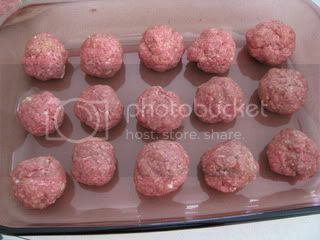 By this time the first pans of meatballs were finished baking. I started transferring them to a plate to cool. The meat in the skillet was done, too, so I turned off the heat and let it start to cool. When it was somewhat cooled, I divided it between two freezer bags. This was well worth the time I spent on it! It will not only save time on busier days, but it'll allow me to serve the foods that my family prefers, such as meatballs instead of meat sauce. A happy family--and efficiency in the kitchen--make me smile! I'm linking up to Cooking Thursday at Sandra's Diary of a Stay at Home Mom! I'm also linking to Freezer Cooking Day at Money Saving Mom (in conjunction with Life as Mom). Great tips!! I have a few freezer meal cookbooks. I need to try them out. :) Our parents gave us a small chest freezer two Christmases ago, and it has been such a blessing. Apparently great minds think a like! LOL. Oh my gosh Melissa I could never be that organized. I'm lucky to plan what meats to prepare for a week, never mind pre-cooking in bulk! maybe now with a baby, I might try this! Thanks for the meatball recipe. I am new to OAMC, and looking for new ideas. I am doing meat loaf mini's for the first time, which I'm excited about.